Retired Major General Muhammadu Buhari who committed treason on December 31, 1983 has done a very bad job as a propagandist. He did this in conjunction with agents of his own Department of States Services (DSS). Buhari in his “propaganda gone sour“ misadventure must have succeeded in enraging outstanding propagandists such as Joseph Goebbels, Muhammad Saeed al-Sahhaf, and Gaddafi’s Moussa Ibrahim. Buhari and his DSS travelled on this road to infamy by creating fake groups and christening them “Indigenous People of Biafra“ with diverse deceptive prefixes such as RE-IPOB, TRI-POB, BUHARI-POB, OKOROCHA-POB, and OHANEZE-POB. It is also interesting to observe that Vanguard Newspapers volunteered to be the official media outfit for these Buhari/DSS-POB’s. The most intriguing aspect of this dance of shame is the use of pseudonyms that are both outlandish and laughable at the same time. For instance, the spokesperson of the Buhari/DSS-POB’s goes by the name “Ikemba Biafra.“ Recently another fictitious name was concocted as “Jonathan Kurubo“ purportedly from Igbogene, a community close to River Nun in Bayelsa state in Biafraland. In the meantime, these individuals are photo-phobic and have no traces or family history. Buhari and his DSS should have done better than this! On the contrary, all principal officers and citizens of Indigenous People of Biafra (IPOB) under the leadership of Nnamdi Kanu bear their real names and have family history as well as real photographs of themselves. 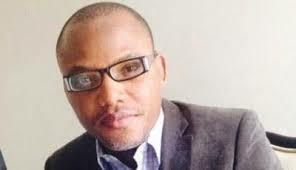 For instance, Nnamdi Kanu is the leader of IPOB and is from Isiama–Afaraukwu Umuahia-Ibeku in Abia state. He is the son of His Royal Majesty Eze Sir I. O. Kanu, the Egwu Ukwu of Afaraukwu. The Deputy leader of IPOB is Mazi Alphonsus Uchenna Okafor-Mefor from Abatete in Idemili area of Anambra state. The Head of Directorate of State of IPOB is Uchenna Asiegbu from Ihetenansa in Orsu area of Orlu senatorial zone in Imo state and he is the son of Late High-Chief Patrick Ezenduka Asiegbu. Dr. Clifford Chukwuemeka Iroanya is the Coordinator of Coordinators and one of the spokespersons of IPOB and he is the son of Ichie-Inyamkwe Bernard Nsidinanya Iroanya from Obilikpa village of Aro-Ndionyemobi community of Oguta local government area in Imo state. We invite readers of this press release to google the pictures of the above-mentioned servants of IPOB to see their faces. Can we say the same for Buhari’s “Ikemba Biafra“, “Jonathan Kurubo“ and “Chima Phillip Effiong Osuji“? Buhari and his DSS should have done themselves a lot of good by sticking to their original plan of using identifiable faces such as Gary Enwo-Igariwe, Joe “Judas“ Igbokwe, Dr. Dozie Ikedife, Monday Ubani, and other similar hungry Biafrans instead of cloning these same people with fake names and fake identities just to try a “propaganda stunt“ on IPOB under the leadership of Nnamdi Kanu. The most ludicrous part was the regurgitation of the expired “divide-and-rule“ strategy of segregating the southern part of Biafraland from the northern part of Biafraland. They tried unsuccessfully to trump up an Ijaw name as the leader of the various Buhari/DSS-POB’s. By carefully inserting a fabricated Ijaw name as the leader of this non-existent group of reprobates (for RE-IPOB), Buhari is looking to generate enmity between the Igbo-speaking part of Biafra and the people of Ijaw. In Buhari‘s warped thinking, he hopes to further make the restoration of Biafra an impossibility by entrenching perpetual enmity among various sections of Biafraland just as Obasanjo and Gowon did through the “abandoned properties“ saga. On our own part, IPOB Worldwide under the unquestionable and supreme leadership of Nnamdi Kanu will help Buhari and his DSS to re-launch BUHARI-POB for the shameless members of Ohaneze Ndi Oshi na Ama, Rochas Okorocha and a few political jobbers who are not ashamed of their lowly political status in Nigeria. Those thinking that IPOB is a pushover is in for a shock. We shall make them to understand that no amount of divide and rule tactic will prevail. Buhari is playing out a script we already knew he would. On August 10, 2015 the creation of new fake IPOB groups was predicted by our leader, so we are prepared for whatever Buhari and Ohaneze Ndigbo leadership will come up with. However, the problem for Buhari is his lack of brinkmanship in the area of propaganda and this is because he is intellectually bereft of any iota of creativity. One can understand that from the day Muhammadu Buhari committed treason on December 31, 1983 till this day, he has not improved himself intellectually but he should have hired intelligent people to do the propaganda work for him instead of making a fool of himself in the present circumstance. We STRONGLY advice Buhari and his DSS to desist from making bad examples of themselves as propagandists because they have become a laughing stock with their Buhari/DSS-POB’s. We reiterate that no amount of fake IPOB groups or uncouth propaganda can stop the restoration of the nation of Biafra!! !